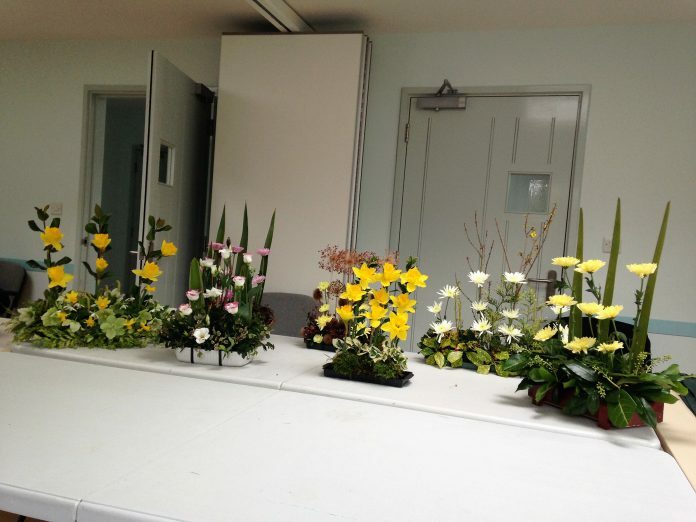 On the second Wednesday of every month, except December, Peasmarsh Memorial Hall hosts the Flower Arrangers Club. 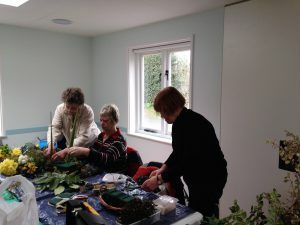 Together, some eight or nine people bring an array of flowers and foliage to this very pleasant hall, where Rhiannon Oliver, a trained florist and experienced teacher and her assistant, Sue Sturmey, are waiting to provide a demonstration and help the varied efforts of the participants. Each month there is a different theme, with Rhiannon demonstrating it at the end of the class. For example, in April we will be doing a water arrangement. All the themes are agreed in advance and a programme is provided. This morning, we were doing our best with parallel arrangements, very modern and surprisingly difficult to get right! Our various efforts are illustrated in the picture below, and the process we undertook to reach the final arrangements is also pictured. Organised by Deidre Bull, if you have always fancied having a go at producing a really balanced and attractive arrangement, why not join the group? New members are very welcome, and their first session, either simply to watch or to participate, is free. We had someone observing today, and she was persuaded by Deidre to try her hand. I think she enjoyed it and we hope to see her again. 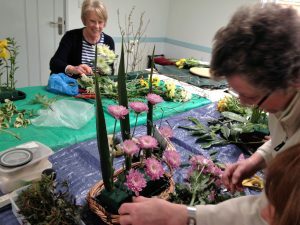 Once a year, the two flower arranging clubs at Brede and Peasmarsh get together to practice their skills and have lunch. We also join in when demonstrations are given by other florists. Rhiannon and Sue lead the Brede club as well as ours. We pay £24 for six sessions, 10am to 12pm and visitors pay £5 for each session. This covers all the costs of the hall and teachers and includes coffee and a biscuit. If you are interested, contact Deidre Bull on 01797 230208. We look forward to seeing some new faces!